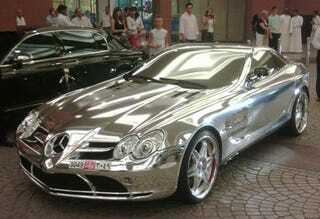 Obnoxiously over the top is an understated way to describe this Mercedes McLaren SLR dressed head to toe in chrome (including chrome-tinted glass) as it causes a scene outside the Mall of the Emirates in Dubai. Although this driver has a license plate number so high we'd assume it belonged to a pauper, we know it takes some serious scratch to buy an SLR, but can only imagine the price tag necessary to go ahead and chrome the living daylights out of it. But, while this silver-skinned SLR makes the all-chrome Audi and the all-chrome Ferrari look like last week's leftover meat loaf, we hear the owner's first choice may have been an all-chrome Bugatti Veyron Pur Sang. Jeez, the Financiapocalypse is really hitting us all, isn't it?